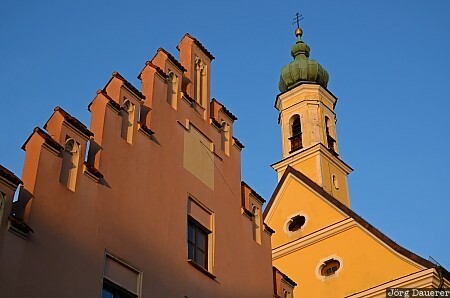 Gables of old houses and a church tower in front of a blue sky in downtown Landshut illuminated by warm evening light. Landshut is in Lower Bavaria (Niederbayern) in the south-east of Bavaria, Germany. This photo was taken in the evening of a sunny day in March of 2011. This photo was taken with a digital camera.